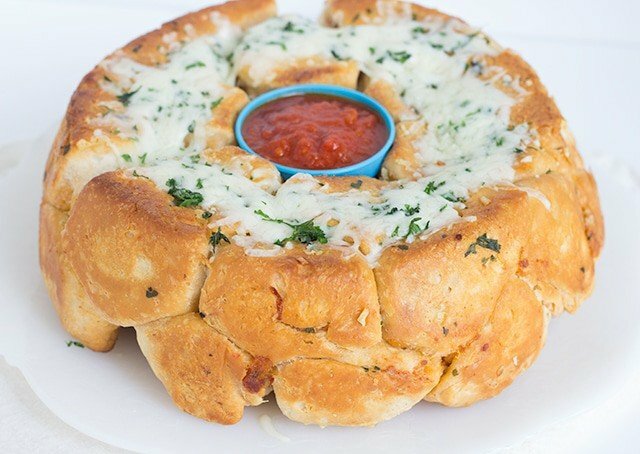 Pizza pull apart bread has been bouncing around in my head for a while now. It’s the dinner and/or appertizer version of monkey bread and if you know me I’m a big, big fan of monkey bread. This is the best kind of dinner if you have a kid that loves pizza and don’t mind them using their fingers. My four-year-old couldn’t get enough of this and the best part is I don’t have to force it down his cute little throat. Okay, so that last sentence sounded a wee bit harsh, but seriously. Have you ever had a little guy that will not eat anything? That’s Lucian. Although, he always has room for junk food. Candy, cookies, slim jim’s, beef jerky, that can all go down with ease. 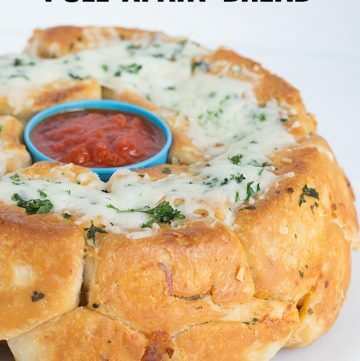 If you notice in the second picture above, there is some ricotta in this pizza pull apart bread. 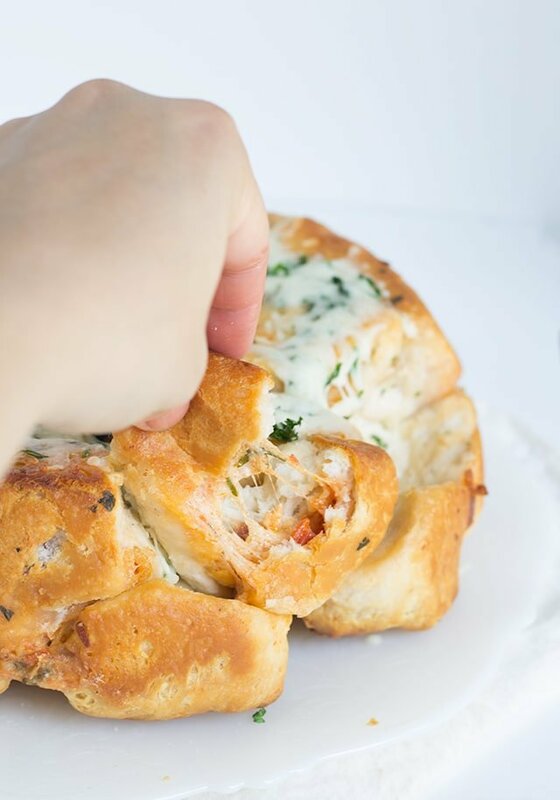 I’m a lover of calzones and couldn’t help but incorporate a little ricotta because of it. I’m not sure if everyone puts ricotta in their calzones, but the local pizza shop where the hubby and I went to college sure did. We ate a lot of those calzones. 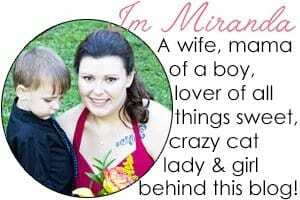 I craved them like a maniac while I was pregnant too. The thing with ricotta is that it can make your bread soggy. I highly recommend putting the ricotta in a fine mesh strainer with a cheese cloth to remove any extra liquid. 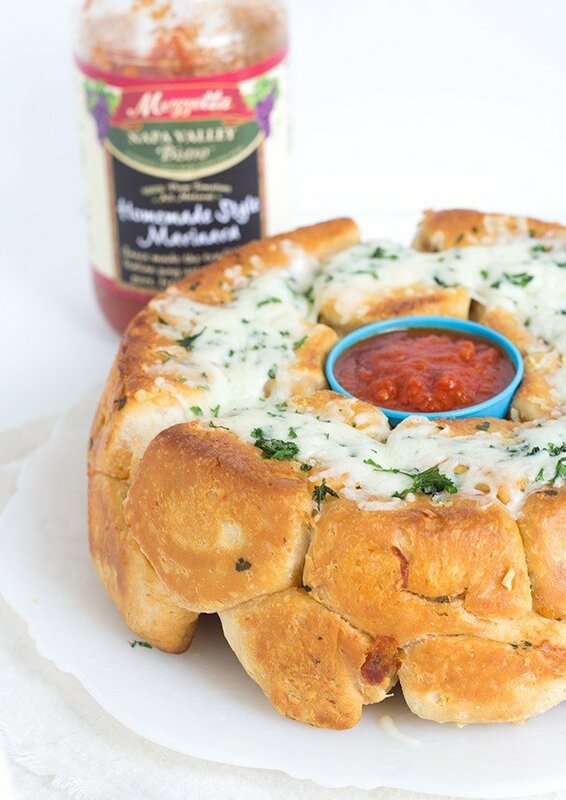 The Mezzetta® Napa Valley Sauce tastes like a homemade sauce. It’s full of flavor and makes the perfect addition to the pizza filling. They have a variety of sauces included spicy marinara, tomato and sweet basil, roasted garlic & caramlized onions, parmesan, asiago and romano and wild mushroom. If I can get my fingers on that wild mushroom, I’ll be in heaven. I can not get enough of a tomato sauce with delicious mushrooms cooked in it. It’s a favorite of mine. Preheat oven to 350 degrees. Get a 9 inch tube pan set out. In a small bowl, add garlich, olive oil and 1 tsp. of parsley. Stir to combine. Place a little bit onto the bottom of the tube pan. Set aside. 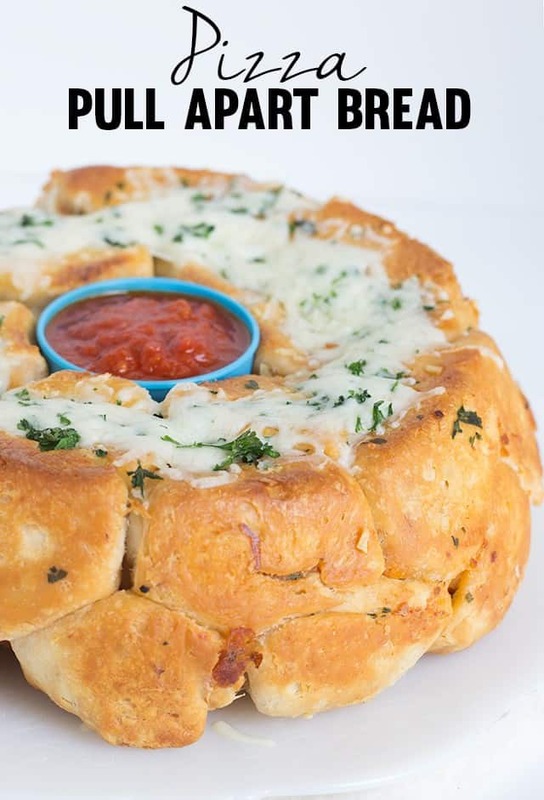 In a large mixing bowl, add in the pepperoni, mozzarella cheese, ricotta, garlic, parsley, salt, pepper and marinara. Stir to combine. Cut each jumbo buttermilk biscuit in half. Press it out. Place about 1 to 1 and 1/2 teaspoons of filling into the center of the biscuit. Fold the biscuit over and press the edges to close them. Tuch in the sides to make it similar to a ball. Place in the prepared tube pan. Repeat with all of the biscuits and pizza filling. Occassionally coating the biscuits with the garlic olive oil. 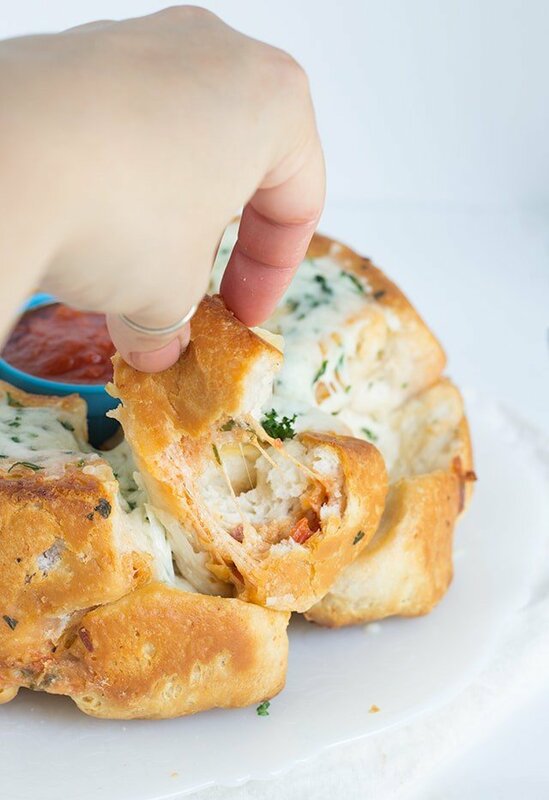 Place the pizza pull apart bread into the oven and let bake for about 60 minutes until the center of the bread is no longer doughy. Run a knife along the edges of the cooked bread. Turn out onto a cake plate. In a small bowl, combine the mozzarella and 1/2 tsp. parsley. Place on the top of the bread. Place under the broiler for about 1 - 2 minutes until the cheese is melted. Serve up with some extra sauce. Oh my, this is a great way to make pizza! Very innovative, soft and yummy! !